Are you are shopaholic??? Do you love roaming in the markets and scanning every bit of item displayed??? Have you missed out any sale??? If these questions relate to your life, then this post will cater you well. Being a buyer or a customer, what attracts you the most is to get the best commodity in least price. I must say that this is though against the law of nature and is not possible. Generally, it has been observed that shopkeepers play different tactics to grasp the attention of their customers. Sale & discounts is one of the oldest and most common way to increase your sales. This not only allows the vendor to sale his items in bulk but also the customers can avail multiple items in reasonable price. But these sales & discount offers are announced on some particular event. But have you ever thought to avail these discounts throughout the year? 24hours.pk is a place where you can enjoy amazing discount offers on all types of commodities. The best part about this site is that this offer is valid throughout the year, So be it summers, winters or spring, just name the particular brand or any food place you will get discounts of which you have never thought of. The concept of online shopping is fully justified here. The main aim of this online forum is the customer’s delight. The discount rates it offers is not limited to 10% or 20%, instead you can enjoy discount up to 90%. The reason behind this relaxation in price is to fully ensure that the customers should free themselves of the hassle they face in shopping form the market. People have to make special arrangements like transport & time in order to go for shopping. But 24hours.pk free the people from this mental torture. Building a long term relationship with the customers is the main aim of this online service. 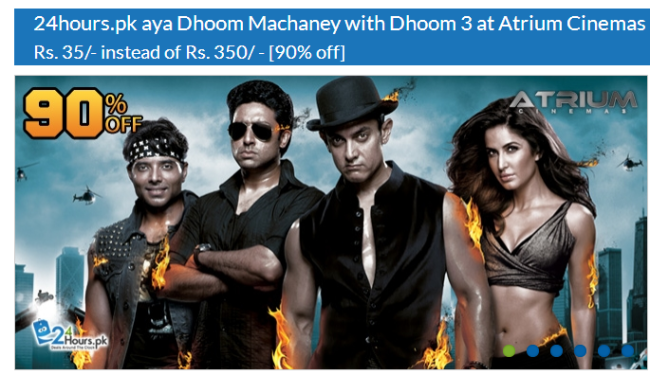 The site sold the ticket of the block buster movie, Dhoom 3 in PKR 35 only. Yes!!! only PKR 35. Hard to believe but it’s true. This means the ticket was sold at 90% discount. It was like a treat for all the women when 24hours.pk came up with amazing discounts at famous beauty salons of the country. Names like Henna Beauty Salon, Heer Beauty Parlor & Jabeen Beauty Salon offered discounts up to 84% and offered their services in very reasonable rates. To conclude it all, I must say that in today’s time finding commodities in such amazing price is not less than a miracle. So, I strongly recommend to avail the services at 24hours.pk. I am sure you will enjoy and making your shopping experience a wonderful one.